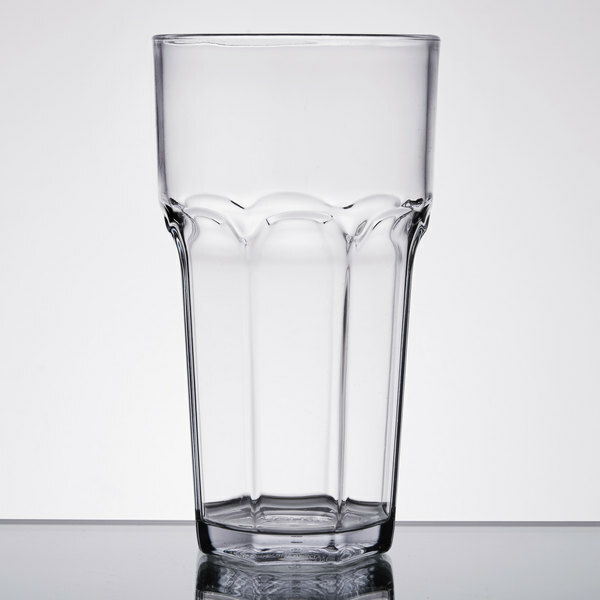 Serve drinks in style with this Carlisle 582207 Louis 22 oz. clear SAN tumbler! Made of durable SAN plastic, this tumbler captures the elegant look of glass with the convenience of break-resistant SAN plastic. 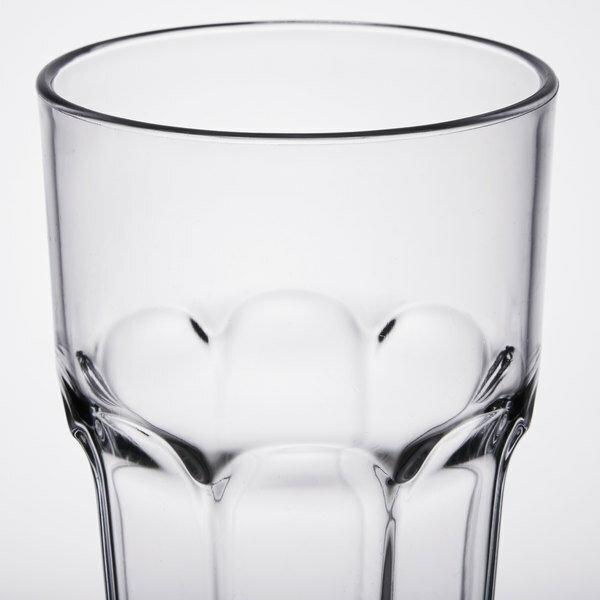 Perfect for outdoor parties and poolside bars, this glass features an attractive, extra thick base and a faceted body that's easy to hold. The unique exterior design also makes it stackable without interior lugs for added convenience. As a light weight alternative to glass, you can save money on replacement costs and serve guests in outdoor environments without the worry and hassle of broken glass. The crystal-clear construction showcases each beverage to enhance your presentation. It also withstands temperatures up to 180 degrees Fahrenheit, making it dishwasher safe for added convenience and quick cleanup. Rim-Full Capacity: 22.5 fl. oz. The closest thing to looking like glass. We use these in our restaurant everyday for sodas, water, & tea. Attractive and very durable, Highly recommend! These plastic cups go through a lot of heavy use at our restaurant and still remain relatively chip and scratch-free. They have a nice weight too that doesn't feel flimsy. There are less expensive plastic cups available but we feel that we are saving money by replacing less frequently. We've used these cups at New Deli for a long time, and not only do they look very classy, but they are very durable as well. Highly recommend this plastic drinkware, by Carlisle. Its stylish high-quality, light and easy to carry. Perfect for outdoor patio parties and poolside activities. Fit's our budget perfectly. We wanted to get them before Mother's Day, but we could not received it. But the customer service was wonderful to deal with. So far we are very satisfied with this products. Great alternative to expensive and breakable 22oz glasses. 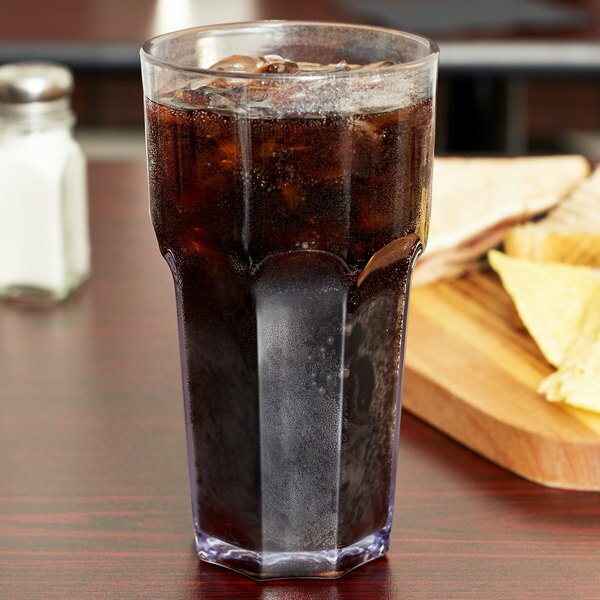 After switching to 22oz Carlisle Louis plastic tumbler we are saving a lot and no more servers breaking glasses and easy to carry on trays light weight. Great glasses for a bar or even banquets. Great alternative to expensive and breakable glass cups. Super durable! Easily stackable. Stylish look. Excellent for diners or even family restaurants! Very lightweight!! As with all the Carlisle Louis glasses these are great. We have been using them for a couple of weeks now and they have held up quite well. 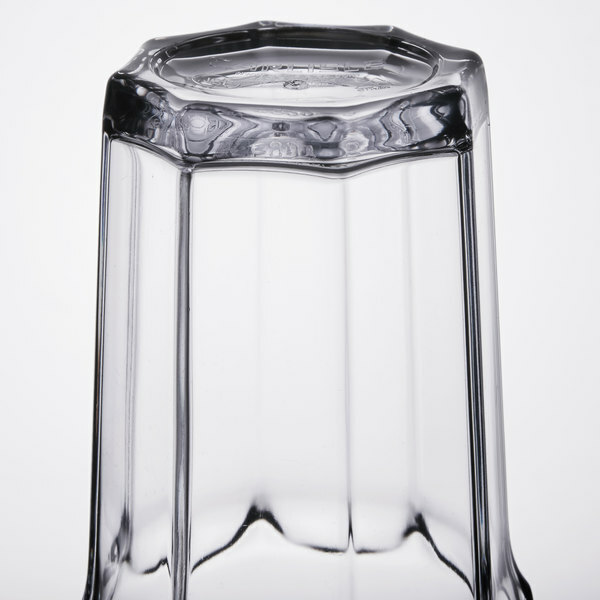 Even with the small scratches that any plastic cup will accumulate over time when cleaned properly the still look good. 22 ounces is the perfect size for a restaurant that wants a slightly bigger cup without going overboard. The size is about as large as I would feel comfortable giving out, anything bigger or heavier might start to be to much for some customers.